the Big World Blog: What is a Dobro? What is a Dobro or Resonator slide guitar? The Dobro or Resonator guitar is a guitar familiar to many as the lap steel sounding instrument on a lot blues, bluegrass and folk music. It is usually metal or wooden bodied and has a metal cone within it that looks and acts like a speaker. It can be played either flat or as a regular guitar. Resonators have round or square necks. The square necked types are nearly always played on the guitarists lap. The player uses a slide or bar made of glass or metal to create a glissando sound. The Slide is used without pressure on the strings. 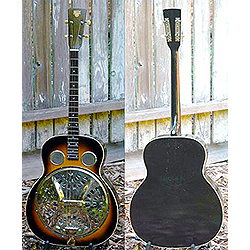 Resonator guitars are made in other formats including bass and electric guitars as well as versions of Dobro banjo and Dobro mandolin. The resonator guitar is a modern icon. (Most noticeably on the cover of brothers in arms album by dire straits). It has been made over the years in brass, nickel-silver or steel as well as wood. The original purpose of the Dobro guitar was to produce a very loud sound to compete with the other instruments. Imagine trying to busk in a busy market place or compete with a band to be heard. Before the electric guitar this is what you looked for. Although it was superseded by the new Les Paul electric guitar and the amplification used for it, the resonator guitar survived because of its distinctive sound. When was the Dobro guitar invented? the sound of the resonator guitar is produced by one or more aluminium resonator cones mounted in the middle of the top. The physical principle of the guitar is therefore similar to the loudspeaker. The original Dobro had a single cone. The name Dobro is now owned by Gibson who market the Dobro brand and the epiphone models which has a range of resonator models. This type of guitar has also been made by other companies including Fender, Vintage, Ibanez, Johnson and National. Resonator guitars may have either one or three resonator cones. The method of transmitting sound resonance to the cone is either by a Spider or biscuit Bridge. These bridges are an intrinsic part of the resonators sound. What is a Spider or Biscuit Bridge? A biscuit bridge is made of a small piece of hardwood placed at the vertex of the cone. This is typical of a National guitar. 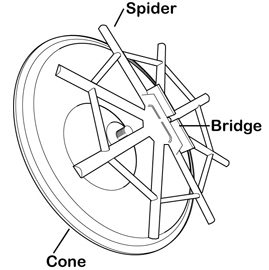 A "spider" bridge is made of metal and mounted around the rim of the (inverted) single cone. This is a typical Dobro design. The sound of the resonator guitar is produced by one or more aluminium resonator cones mounted in the middle of the top. The physical principle of the guitar is therefore similar to the loudspeaker. The Tricone uses 3 cones with a bridge that rests on all three at the same time. Resonator guitars may be played in the traditional position or flat on the lap. They usually have 6 strings although many variations have been built since from 4 string to 6, 8, and 12 string models. The resonator or Dobro guitars are usually tuned differently to standard guitar tunings including tunings in the key of A, G and D. This allows the use of a slide or bar to play in tune on any fret by covering all the strings. (more on this later ). The gauge of strings is dependent on the players style. They are nearly always metal and may be played with finger picks, the fingers or a plectrum. this choice is again up to the player. The choice of strings depends also on the neck of the guitar the square necked resonators are better suited to very heavy strings.